Do you shop on-line and search for the latest deals for certain sites? Then always wonder if the code is still working? Or perhaps go into the store but search for coupons first? Or maybe you are one of those people who do not want to give your email out to get the coupons. (I have a Hotmail account for businesses that I only check when I want a coupon.) However I have recently discovered Dealspotr.com. 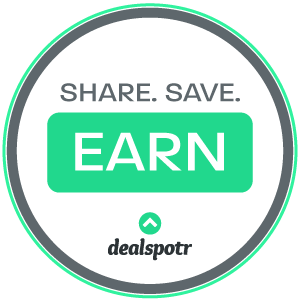 Dealspotr makes getting coupons, promo codes and deals so much easier. It is a site that is crowdsourced. People literally enter in the codes and sales when they get notification of one and other people validate the sale. Plus, people post a picture of the deal either working or the banner with the details. When I post a picture I often just make a fake order and use the code. It is so easy, and you earn rewards for posting and validating so people are doing it all the time!! Yes, you can earn gift cards by posting and validating!! For example, Michael's is having a sale this weekend. You can click the link below to see how it is listed on Dealspotr and use it. Perfect for all you crafters!! This site provides a simple one stop shopping for deals for on-line or at the store. It gives you the latest without having to go through all those emails or ads. You can simply type in the store name where you will be shopping and see the latest deals for that store. If it is a coupon for in store shopping you can be taken to a link to print it or have an image there to print. If it is a code for on-line shopping you can chose to copy it right from Dealspotr and go shop. The deals can be BOGOs, percentage off, free shipping and many more!! Here's another deal for you from Hanna Andersson. The shopping venues seem endless on Dealspotr. They have Magic Cabin (which has freeshipping right now), Oriental Trading (also has free shipping), Starbucks, Joann Fabrics and Crafts (has a free wall calendar), Kohls, and so many more!! The best part is you can search by store name, by on-line, or in store, by freebies, BOGO, promo codes, product deals, or all deals. You can search by interest or top stores like Target, Amazon, Best Buy, Apple, and more. There are so many options it is great and easy to find deals! Our February school vacation week is coming up. Are you planning a trip? There are even discounts on things like hotels, luggage and car rentals. Dealspotr is a one stop place to find all the deals around. You really have to check this site out. You will be amazed and it will simplify your life. You can stop getting all those advertising emails and just go to Dealspotr. So head over to Dealspotr and get saving!! Just click one of the links I have provided and see how you can save. 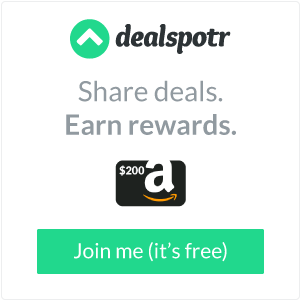 And even better join me there as an influencer and start earning gift cards.Want to join Dealspotr and start helping post the deals? It is easy. Go here and join and follow the simple steps to become a new user. Or if you decide while you are checking it out, I would love to get the credit (for more rewards) and will if you use my personal referral code: CRAFTYMOMSSHARE (I would really appreciate it). So go check out the deals that are out there. How do you find good deals?